NOTE: Because of the length of this extremely relevant essay by the late Prof. Constantino, I have posted it in three parts. This is the last part. See Part 1 and Part 2 . A PDF version of this 3-part series is now available free on request by email to bmdrona@gmail.com. Please share with your friends and relatives, especially in the homeland. Thank you. A foreign language is an impediment to instruction. Instead of learning directly through the native tongue, a child has first to master a foreign tongue, memorize its vocabulary, get accustomed to its sounds, intonations, accents, just to discard the language later when he is out of school. This does not mean that foreign language should not be taught. Foreign language should be taught and can be taught more easily after one has mastered his own tongue. Even if the Americans were motivated by the sincere desire of unifying the country through the means of a common tongue, the abject results of instruction in English through the six decades fo American education should have awakened our educators to the fact that the learning process has been disrupted by the imposition of a foreign language. From 1935, when the Institute of National Language was organized, very feeble attempts have been made to abandon the teaching of English. Our educators seem to constantly avoid the subject of language; inspite of the clear evidence of rampant ignorance among the products of the present educational system. This has resulted in the denial of education to a vast number of children who after the primary grades no longer continue schooling. Inspite of the fact that the national language today is understood all over the country, no one is brave enough to advocate its use as the medium of instruction. There are arguments about the dearth of materials in the national language, but these are feeble arguments that merely disguise the basic opposition of our educational leaders to the use of what is native. Thus the products of the Philippine educational system, barring very few exceptions, are Filipinos who do not have a mastery of English because it is foreign, and who do not have a mastery of their native tongue because of the deliberate neglect of those responsible for the education of the citizens of the nation. A foreign tongue as a medium of instruction constitutes an impediment to learning and to thinking because a student first has to master new sounds, new inflections, and new sentence constructions. His innermost thoughts find difficulty of expression, and lack of expression in turn prevents the further development of thought. Thus we find in our society a deplorable lack of serious thinking among great sections of the population. We half understand books and periodicals written in English. We find it an ordeal to communicate with each other through a foreign medium, and yet we have so neglected our native language that we find ourselves at a loss expressing ourselves in this language. Language is a tool of the thinking process. Through language, thought develops, and the development of thought leads to further development of language. But when a language becomes a barrier of thought, the thinking process is impeded or retarded and we have the resultant cultural stagnation. Creative thinking, analytical thinking, abstract thinking are not fostered because the foreign language makes the student prone to memorization. Because of the mechanical process of learning, he is able to get only a general idea but not a deeper understanding. So, the tendency of students is to study in order to be able to answer correctly and to pass the examinations and thereby earn the required credits. Independent thinking is smothered because the language of learning ceases to be the language of communication outside the classroom. A student is mainly concerned with the acquisition of information. He is seldom able to utilize this information for deepening his understanding of his society's problems. Our Institute of National Language is practically neglected. It should be one of the main pillars of an independent country. Our educators are wary about proposing the immediate adoption of the national language as the medium of instruction because of what they consider as opposition of other language groups. This is indicative of our colonial mentality. Our educators do not see any opposition to the use of a foreign language but fear opposition to the use of the national language just because it is based on one of the main dialects. The fact that one can be understood in any part of the Philippines through the national language, the fact that periodicals in the national language and local movies have a mass following all over the islands, shows that, given the right support, the national language would take its proper place. Language is the main problem, therefore. Experience has shown that children who are taught in their native tongue learn more easily and better than those taught in English. Records of the Bureau of Public Schools will support this. But mere teaching in the national language is not enough. There are other areas that demand immediate attention. Philippine history must be rewritten from the point of view of the Filipino. Our economic problems must be presented in the light of nationalism and independence. These are only some of the problems that confront the nationalist approach to education. Government leadership and supervision is essential. Our educators need the support of legislators in this regard. In this connection, the private sector has also to be strictly supervised. Before the Second World War, products of the Philippine public school system looked down upon their counterparts in the private schools. It is generally accepted that graduates of the public schools at that time were superior to the products of the private institutions in point of learning. There were exclusive private institutions but these were reserved for the well-to-do. These schools did not necessarily reflect superiority of instruction. But they reflected superiority of social status. Among students of the public schools, there was still some manifestation of concern for national problems. Vestiges of the nationalistic tradition of our revolution remained in the consciousness of those parents who had been caught in the mainstream of the rebellion, and these were passed on to the young. On the other hand, apathy to the national problems was marked among the more affluent private school students whose families had readily accepted American rule. Today, public schools are looked down upon. Only the poor send their children to these schools. Those who can afford it, or those who have social pretensions, send their children to private institutions. The result has been a boon to private education, a boon that unfortunately has seen the proliferation of diploma mills. There were two concomitant tendencies that went with this trend. First was the commercialization of education. A lowering of standards resulted because of the inadequate facilities of the public schools and the commercialization in the private sector. It is a well known fact that classes in many private schools are packed and teachers are overloaded in order to maximize profits. Second, some private schools which are owned and operated by foreigners and whose social science courses are handled by aliens flourished. While foreigners may not be anti-Filipino, they definitely can not be nationalistic in orientation. They think as foreigners and as private interests. Thus, the proliferation of private schools and the simultaneous deterioration of public schools have resulted not only in lower standards but also in a definitely un-Filipino education. Some years ago, there was a move to grant curricular freedom to certain qualified private institutions as well as wider leeway for self-regulation. This was a retrograde step. It is true that this move was in answer to charges that state supervision would enhance regimentation. But in a country that is just awakening to nationalist endeavors, it is the duty of a nationalist administration to see to it that the moulding of minds is safely channeled along nationalist lines. The autonomy of private institutions may be used to subvert nationalist sentiments especially when ownership of schools and handling of the social sciences are not yet Filipinized. Autonomy of private institutions would only dilute nationalist sentiments either by foreign subversions or by commercialization. While the basic defect in the educational system has been responsible for the lack of nationalist ideals, there are other media and facilities that negate whatever gains are made in some sectors of the educational field. The almost unilateral source of news, films and other cultural materials tends to distort our perspective. american films and comics, American press services, fellowships in America, have all contributed to the almost total Americanization of our attitudes. A distinct Filipino culture can not prevail if an avalanche of western cultural materials suffocates our relatively puny efforts in this direction. The education of the Filipino must be a Filipino education. It must be based on the needs of the nation and the goals of the nation. The object is not merely to produce men and women who can read and write or who can add and subtract. The primary objectis to produce a citizenry that appreciates and is conscious of its nationhood and has national goals for the betterment of the community, and not an anarchic mass of people who know how to take care of themselves only. Our students hear of Rizal and Bonifacio but are their teachings related to our present problems or do they merely learn of anecdotes and incidents that prove interesting to the child's imagination? We have learned to use American criteria for our problems and we look at our prehistory and our past with the eyes of a visitor. A lot of information is learned but attitudes are not developed. The proper regards for things Philippine, the selfish concern over the national fate --these are not at all imbedded in the consciousness of students. Children and adolescents go to school to get a certificate or diploma. They try to learn facts but the patriotic attitude is not acquired because of too much emphasis on forms. What should be the basic objective of education in the Philippines? Is it merely to produce men and women who can read and write? If this is the only purpose, then education is directionless. Education should first of all assure national survival. No amount of economic and political policy can be successful if the educational programme does not imbue prospective ciizens with the proper attitudes that will ensure the implementation of these goals and policies. Philippine educational policies should be geared to the making of Filipinos. These policies should see to it that schools produce men and women with minds and attitudes that are attuned to the needs of the country. Under previous colonial regimes, education saw to it that the Filipino mind was subservient to that of the master. The foreign overlords were esteemed. We were not taught to view them objectively, seeing their virtues as well as their faults. This led out citizens to form a distorted opinion of the foreign masters and also of themselves. We must now think of ourselves, of our salvation, of our future. And unless we prepare the minds of the young for this endeavor, we shall always be a pathetic peole with no definite goals and no assurance of preservation. If the Americans didn't educated us, I just dont know how we look like today. Perhaps we still believe in primitive witchcraft medicine. Imagine the millions of overseas filipino contract workers if they can find a job in their own country. Their edge is that they speak english. Maybe we are still a colony of Spain or after the colonizer left most people are still illiterate who could not even speak english to compete in the world job market ex Guatemala & Ecuador. It's true that nationalism is less a priority. Why? because our leaders coming from the wealthy and rich class are not nationalist either. During the time of Jose Rizal, Aguinaldo, Mabini, etc who belongs to the middle and upper class of the society had a sense of loyalty and nationalism to their motherland. Now politicians have numerous bank accounts abroad. Some of the ideas in this article are true but the analysis and opinions I resent because it fails to compare the old and new attitudes of Filipino leaders. Todays Filipino leaders are corrupt so that is the reason why the country can't move on and people are leaving to migrate to a better land. We must be thankful that we are educated by the Americans however education whether Americans, British or Spanish if use for personal gains and corruptions then its eco-socio-political system suffers. two-bits thinking at the this point. own weight and use his own mass against him. American editors. A lot more name there are. Though I have read, reread and keep many of his published works, I never came to know him personally and do not know whether he really hated America and/or Americans as a people. As you may know, nationalism is a sentiment and may serve as an ideology too. Like you I believe in education as a possible solution to the long-term improvement of the Filipino masses; an education that teaches a means to decent livelihood AND a means to understand his and society's realities, to identify the symptoms versus the roots of his daily personal misery and that of his society. Of course such education will need to touch on the geopolitics of international economics, capitalism in terms of individual persons as investors versus corporate/transnational and institutional investors, etc. In a globalized economy the ordinary, individual investor is really a nonfactor. We seem to forget that, although we hear a lot of talk (propaganda or advertisement) about the "foreign investors", as if we still have much individual foreign investors. I understand your valid points especially on education. However, the prior questions that we need to address are: how do we implement that kind of education, how and who will finance it? Can we see that happening in present realities where the national leadership have been/are corrupt and have only demonstrated selfish and subservient interests? Can we see that occurring when our educational system is designed to follow the IMF/WB/ADB "recommendations" as preconditions to continuing loans; and we know these supposedly neutral and benevolent international institutions are prophets of economic and cultural globalization (neocolonialism)? Gil, I frankly do not see such an education being realized without a strong motivation from a leadership, supported by a nationalistic populace, that would push for a nationalistic educational program. Here again, the prior issue asks how can we have a nationalist leadership and a nationalistic majority? Not from the recent, present and foreseeable governments and institutions. But it really has to start somewhere, somehow. It is discouraging indeed. I feel and think that we Filipinos seem to have significantly lost nationalism among the younger generations since the Marcos Dictatorship, but we just have to continue fighting for nationalism (that's what I try to do in my own little way). Else, a nation of decolonized Filipinos will not come to reality. And the Filipino will perpetually be having his "damaged culture," continually living his life of selfish individualism inherited from his culture and reinforced by the historical neglect from his government; with no sense of national community beyond his circle of family and friends. A country not his own since it will not be under his control, and therefore not a nation he can call his own. A bleak future for a country and a people that only a thinking Filipino can appreciate and sadly long for especially when he looks at his homeland from afar, in a foreign soil. You know, there are several recently published books entitled "What If?" That is, speculating on "what ifs" than what was/were. I do not want to waste your time and mine on such. Frankly, to see Filipino nationalism as anti-American by a fellow Filipino is doubly disappointing and disturbing, I know your feeling and thought may not even be that of a minority. That only shows how subtle and effective was our Americanized education. If you reread the posting and some others, you may not miss the point. Seeing Filipino nationalism as anti-American is to misunderstand the causes and content of our nationalism. 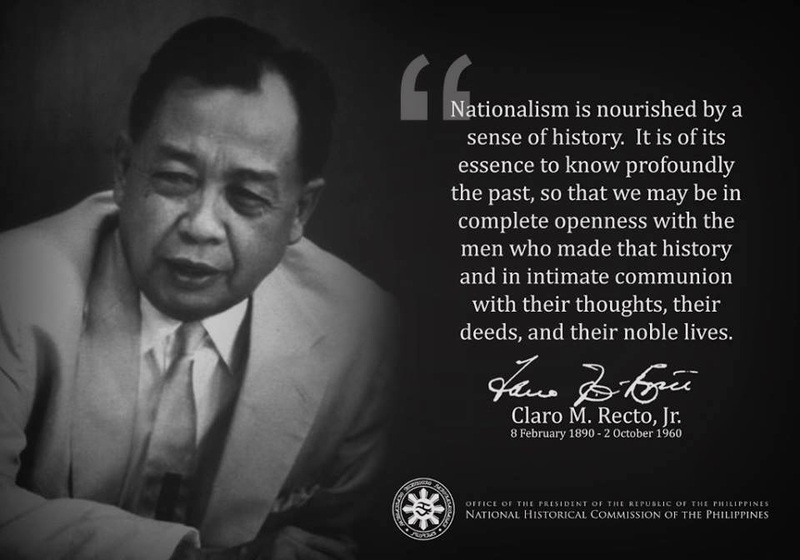 Filipino nationalism was there even before the Americans came to intervene (in our forefathers fight for independence against Spain), brutalize, occupy our homeland and transform our people into a herd of sheeps. Filipino nationalism is to assert our sovereignty,i.e. control within our territory just like any nation, including America, to be assertive in the control of its economy, politics, etc. within its borders (in fact, America is avowedly internationalist,i.e. wanting and having control BEYOND its borders in reality). We native Filipinos are not in control. And we the educated are to blame; not the uneducated masa. Thus the masa has to be educated (for employment and including so-called educated, for critical thinking to understand "what is really going on." Then with that understanding, they will be transformed to be assertive and act to pressure, or fight for and replace subservient leaders in all sectors of society and thus regain control of the homeland. To finish the unnfinished revolution of our native heroes. And the last thing we need in the regions is to be dominated again. It is hypocritical how Filipino-language fighters EVADE the idea that lots of Filipinos are not born Tagalogs. Tagalog, like English is merely a foreign tongue to us. And how dare Tagalogs deny us of the chance for global competency by replacing English with their own sweet Tagalog, while leaving our mother tongues to rot in the household? Excuse me. If this is your idea of nation-building, you can have Philippines on your own and allow us to secede from your nation which you mold using Tagalog hands - alone. Even before the Spanish colonizers came, the Filipino people are already gearing towards progress. We already had trading for instance with China, Middle East etc. There is nothing wrong with learning foreign language, culture, etc. but if it is intended to manipulate and control society's culture, then something must be checked. If we observe, the Philippine Economy is export oriented and import dependent. It exports raw materials as the Imperialist US needs for its Industry and it imports commodities to accommodates finished products from the same Imperialist too. These mean that our government is not interested in local industrialization, anyway they are also controlled by the US, and the US would not allow that otherwise we become their competitor on raw materials and market. Thus, the concept of a nation building in the Philippines is a myth. We even import our skilled labor forces that are vital for nation building instead of leading Filipinos to become productive in their own land. have to may help you. s do you want every specifics of colleges also univerisity then we will benefit you.